On April 7, Reading Rotarian and Eagle Scout John Halsey presented certificates of congratulations to Troop 702’s new Eagle Scouts, Ben House, and Bryan Doucette at their Eagle Court of Honor. John has been working with District Governor David Gardner to strengthen the partnership between Rotary and Scouting. John is also on a Council Member for the Spirit of Adventure Council, which includes Reading. 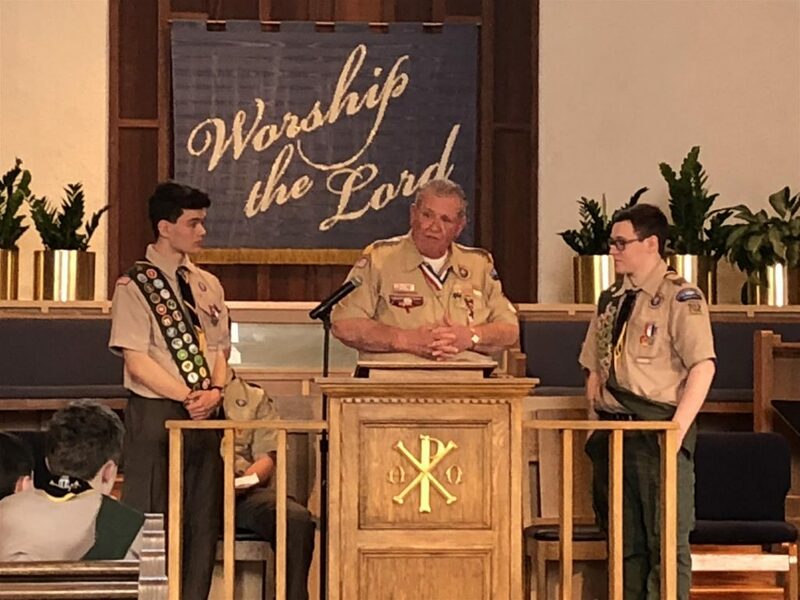 John has been busy attending Eagle Courts of Honor in Reading as Troop 702 (sponsored by Old South Church) and Troop 728 (sponsored by St. Agnes) have been producing a lot of Scouts reaching the Eagle rank. In his remarks during the Court of Honor, John said that Reading is known in the Spirit of Adventure Council as the Eagle’s Nest because the town has produced more Eagle Scouts over the past 12 years than any other municipality in the Council, including Boston and much larger cities and towns. Reading Rotary will contribute to Boy Scouts working on their Eagle Service Project and Girl Scouts working on their Gold Award Project. Rotary donated $200 to Bryan’s Eagle Project, improvements to the Pinevale Conservation Area trail. Ben’s Eagle Project was the creation of over 70 care packages that were sent to veterans overseas. The Eagle Scout Service Project requires the Scout to conceive of and oversee a community service project involving many volunteers. The beneficiary of the project must be a charitable or municipal entity. The Scout must obtain approval from his Troop and Council, raise all the funds needed, then oversee the project to completion, following all required safety and other requirements. Rotary partners with Scouting because both share the same mission of service to the community. Congratulations, Ben and Bryan, on your impressive achievements. The Rotary motto is “Service Above Self.” We are Rotarians because we believe in community service and helping make our communities better. Please consider becoming part of our Rotary Club and help us make our community and the world a better place to live in. If you can’t join, you can volunteer with us. Please be our guest at a lunch meeting and learn more about us. We have meetings at Reading Public Schools Administration Office on Mondays at 12:15 and one Wednesday evening per month. See our Event Calendar for specifics.) All are welcome. To learn more about us, you can just ask any Rotarian, look through our website or follow us on Facebook and Twitter @ReadingMaRotary.